We looked at the top 13 Televisions and dug through the reviews from 124 of the most popular review sites including Tech Radar, RTINGS.com, Digital Trends, 4K, CNET, New York Times Wirecutter and more. The result is a ranking of the best Televisions. 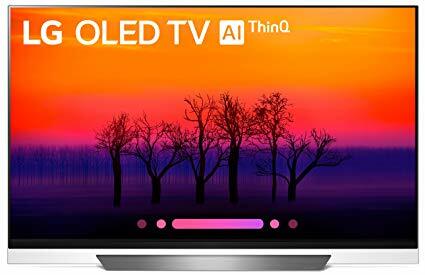 Our experts reviewed the top 13 Televisions and also dug through the reviews from 124 of the most popular review sites including Tech Radar, RTINGS.com, Digital Trends, 4K, CNET, New York Times Wirecutter and more. The result is a ranking of the best of the best Televisions. You can save money while still accessing great features with the slightly older TCL model, the 5 Series. It includes Dolby Vision for accurate color and crisp video. But it doesn't get quite as bright as other TVs, making it a better option for darker rooms. The TCL 5 Series is a great set for gamers, thanks to its low input lag. DWYM Electronics Experts plus New York Times Wirecutter, CNET, RTINGS.com, The Verge, Tom’s Guide and 1 more. Along with user reviews from Amazon.
" The TCL 5-Series TV offers image quality on a par with much more expensive TVs, and it offers media-streaming services and some extra features that costlier TVs don’t have." "Vizio's E series has a superior picture for a similar price. Image quality with HDR sources isn't significantly better than non-HDR." 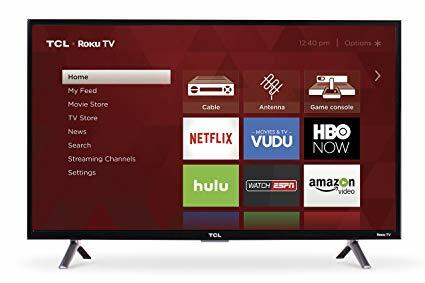 The TCL 5-Series TV offers image quality on a par with much more expensive TVs, and it offers media-streaming services and some extra features that costlier TVs don’t have. Roku TV delivers the simplest, most comprehensive smart TV experience on the market, with more apps than competitors, including support for 4K, HDR and Dolby Vision. Supports HDR10 and Dolby Vision, and can produce great vivid colors but can't produce bright highlights. For gamers, it has a low input lag which is excellent. The 5 Series is TCL’s step down from the 6 Series, and it essentially replaces the current S Series. For 2018, TCL is introducing Dolby Vision HDR in addition to the already-supported HDR10. 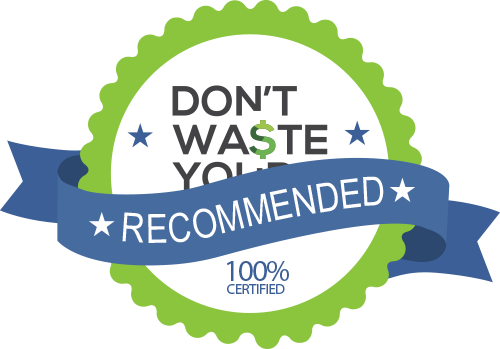 Continues this tradition by offering not only a great price and solid quality, but by adding unexpectedly premium features – like Dolby Vision, Dolby Atmos sound, and a better-than-average version of Roku TV – to this value-packed budget TV. The TCL 5-Series doesn’t have local dimming, so we don’t consider it a true HDR TV. The panel has only a 60 Hz refresh rate. Vizio's E series has a superior picture for a similar price. Image quality with HDR sources isn't significantly better than non-HDR. It doesn't get very bright, so it probably wouldn't be a good fit in a sunny, well-lit room. If that's a concern for you, we recommend spending a little extra on the TCL 6 Series. Viewing angles were somewhat limited, with noticeable color shifting when viewed for more than about 20 degrees off. Vertical angles were just as limited. Televisions have likely come a long way since the last time you were in the market for a new screen. TVs have followed the typical tech trajectory of slimming down and dropping weight while increasing screen sizes. Even if your current TV is only a couple years old, technology has skyrocketed in that time to produce incredible visual effects. That’s largely due to the introduction of 4K TVs. These 4K TVs bring along crisper, brighter and more colorful picture quality than ever before. There are truly outstanding 4K TVs available with four times the amount of pixels as their 1080p predecessors. On top of that, they boast the latest and greatest screen technology. All of that adds up to the ultimate in viewing experiences, no matter what you choose to watch. Quite frankly you’ve never seen your favorite shows or anything from around the world so vividly from the comfort of your couch. But all these new and improved features can make choosing a new TV complex and confusing. There are many new numbers and acronyms in the descriptions that can sound like a foreign language to a new buyer. However, armed and ready with a bit of knowledge and a few tools of the trade, you can make an informed purchase and find the best 4K TV for you. One of the first factors to consider is size. Measure and understand how much space you have for your TV. You’re more likely to mount a 4K TV on your wall than set it on a console, but some models have legs and can sit on a stand. It’s worth noting, these legs are generally at the outer edges of the TV, instead of in the center, affecting the overall dimensions of the stand. Additionally, TVs are measured diagonally, so take that into consideration when you assess your space and size needs. Now, the standard resolution is 4K Ultra HD, which offers four times the pixel resolution as previous 1080p HD. That means crisper, more detailed images. It also lets you sit closer to larger TVs without the usual image degradation. Pixels alone aren’t responsible for the wow factor that comes with 4K TVs. For that, you need to dive into the additional differentiating acronyms. When you combine screen technology like High Dynamic Range (HDR) and Wide Color Gamut (WCG), that’s when those extra pixels really pop. What’s more, these 4K TVs have all the features you need seamlessly integrated. They are smart TVs. That means there are no more gadgets or cords required to connect to apps, streaming services and more. It’s all in one. The latest and greatest technology doesn’t always come cheap. While there are three excellent budget-friendly buys in the top 4K TVs, there are also spendier versions. 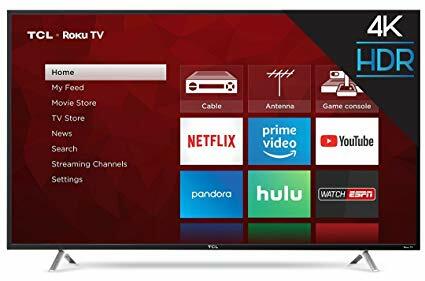 They start under $500 for the budget-friendly TCL 55S517 55-Inch 4K Ultra HD Roku Smart LED TV, $600 for similar TCL 55R617 55-Inch 4K Ultra HD and $750 for the Vizio P Series 55-inch. 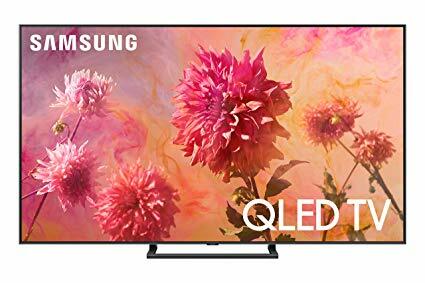 The splurge version is the Samsung QN65Q9FN FLAT QLED 4K UHD 9 Series Smart TV at $3,000 for the 65-inch. At that price, the Samsung delivers much more than a standard TV viewing experience. In fact, it includes a new Ambient Mode, which displays decorative content, useful information, personal photos or background music to blend with and enhance your interior décor. You can rest assured it’s a good time to upgrade your TV. There are always updates and new technology in the works, but the next big change to 8K resolution is still a ways off. 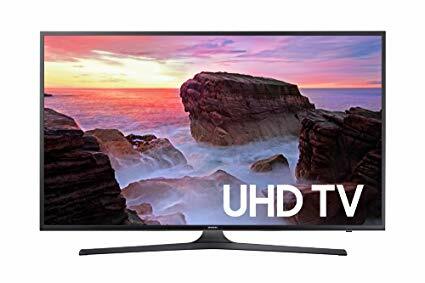 Most televisions 50 inches and larger available for sale today are 4K. However, this high-definition resolution and massive size wasn’t always the norm. The earliest televisions were very primitive in comparison. RCA began selling the very first television sets and broadcasting regular programs back in 1939. These had 5-by 12-inch (12.7 by 25.4 cm) picture tubes. Television technology has progressed by massive leaps and bounds since the early days. Still, for decades, the primary resolution used to describe TVs was the vertical resolution. The switch to 4K, or horizontal resolution, only came in recent years. Even now, not all content will come in at 4K level. There isn’t any U.S. broadcast TV at this level yet. However, you can find 4K content in from many streaming services, like Netflix, Amazon, iTunes and Vudu. You can also access 4K content with Ultra HD Blu-ray players and gaming consoles, like the PS4 Pro and Xbox One X. What you can expect in the future is even more shifts, including increases in pixel resolution and more innovative technology. No matter what, the future of TV viewing is getting clearer and crisper with each new innovation. Remember to measure twice before selecting a new 4K TV. The screen measurements listed on TVs reflect the diagonal distance on the screen. The other measurement is the width of the TV, for sitting on a stand as well as hanging on the wall. The newest 4K TVs have four times the pixels of the previous 1080p TVs from a few years ago. There is new, advanced pixel technology in the works. However, it is a few years away still, so it’s a good time to upgrade to the latest and greatest 4K TVs available now. The larger the number of pixels, the closer you can sit to the TV and still see a crisp clear image. The new 4K TVs vary widely in price, so researching each of their distinguishing features could help you choose a more cost-friendly option. The official resolution for 4K TVs is 3,840 by 2,160, so they are just shy of truly 4,000. The simplified description is much more user-friendly, so it stuck. For the Television category, we analyzed 124 of the most popular reviews including reviews from Tech Radar, RTINGS.com, Digital Trends, 4K, CNET, New York Times Wirecutter and more. The result is a ranking of the best Televisions.